On Monday May 21 from 630pm-8:30pm we'll be hosting another one of our ladies drawing night. The evening's theme will be illustrations led by local designer and illustrator Riley Sheehey. This isn't a class! Rather, it's a free-form drawing night with suggested prompts for creativity. So please BRING YOUR OWN DRAWING SUPPLIES. Paper will be provided. Feel free to come and go when you want anytime between 630pm-8:30pm. Riley started Make Things Co., a freelance design and illustration company, in the summer of 2014, after a good friend asked if she'd be interested in designing a custom watercolor invitation suite for her upcoming wedding. In June 2017, Riley left her elementary school teaching career to pursue freelance art full-time. 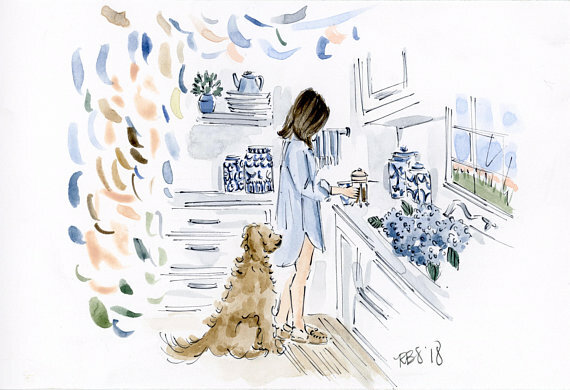 Riley specializes in custom watercolor portraits and paintings, wedding stationery design, and fashion illustration, but is always open to new opportunities to create things that make people smile.